It’s WoW Dungeons for Dummies. Huntard Edition. After nearly two years out due to rl stuff, a friend is back in the game. I’d previously sent her a scroll of resurrection the last time so she was boosted to 80 from 13 and played for a bit. After her boost it was confusing enough, going from a tiny char to this ‘beast’ with all these new buttons and abilities to get her head around. Now that she has time to play again and Mists has a 10 day free trial, she took the plunge and reactivated her account. I got a message saying that she couldn’t get to Pandaria and the 10 day trial would be a waste. After telling her to that you can’t use the portal until you were level 85, I told her to hold on and logged in. She had made it to the portals in Stormwind and remembered what buttons control your flying! I explained that I could get a Mage to portal her to the Shrine and she could get in that way. She joked that she didn’t know a Mage as she was still at the time in a guild I used to be in back in the day. I sent her another hold on. Scouring the guild roster there wasn’t a Mage online at the time so it would come down to finding someone to log an alt. A guild mate logged his Mage and asked what the char name was, telling him he replied with ‘go go’. I was in the shrine so I went running off to Stormwind to meet her. I found Gooseberry there creating a portal. I landed next to them just as she went through. I’d inadvertently confused him as he thought he was summoning an alt of mine back to the shrine. He was a little confused when I showed up but carried on regardless. This was where the fun begins. Trying to explain the Shrine to her and the layout we were standing in the side with the inn and looking through the doorway to the main staircase I told her about the repairs that are on the other side of it, she went running off and then sent me a whisper just saying ‘LOST’ when I said to go outside so we found do a little exploring. Things like this now I just take for granted, I know where to go for Alchemy items in Stormwind without needing directions (back in the day they Guards were just Tourist Information for me) I know which portal to take to get me from Shrine to Caverns of Time. How do you start getting this across to someone who has been out of the game for two years, and now is only 8 levels away from max? I did send her a A4 size ‘fact sheet’ about gear and stats. While we were in a dungeon, we got talking about all her gear and how it was an eclectic mix of mage/warlock cloth and Warrior cloaks… As neither of us were on TS I couldn’t really go through it all on chat. The next best thing is to write it down. I can’t promise everything here is strictly correct. So don’t burn me down just because I missed off a class or I’m explaining it way to simply and that doesn’t actually happen… Also, she’s a hunter, obviously there are somethings that are not going to be able to go across all classes. Also, if your a Tank… sorry. 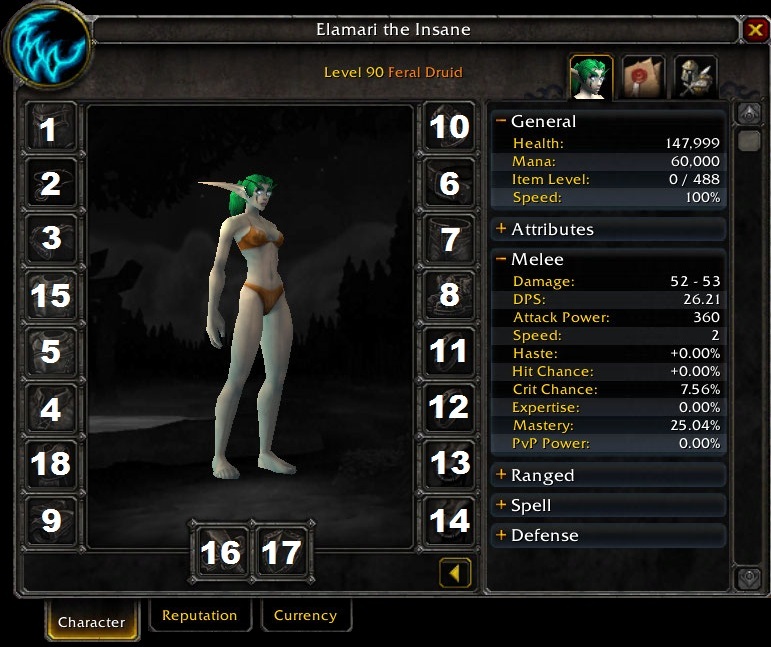 Anyway this is WoW Dungeons for Dummies. Enjoy! Often referred to as ‘Huntards’ due to a reputation for players who don’t control their pets very well and are generally poor at playing it. The Hunter is a strange class. Classified as ‘Ranged’ DPS and therefore listed with Mages, Warlocks and the like. They are different as their damage is physical rather than magical. With this in mind they have a ‘power source’ all of their own which is ‘Focus’ rather than ‘Mana’. They posses the distinct advantage that they are able to continue casting through interrupts that will prevent other ranged players from doing anything. Hunters also have the ability to shoot while moving, very handy when you need to avoid things while still attacking. There are many different pets a Hunter can have which bring different things to the party. Some have the ability to Combat Res a dead team mate while the fighting is still going on, others have Buffs which improve DPS or Healing etc… While in dungeons you can bring whatever pet you like, its always handy to have a selection that provide different Buffs just in case something is needed. There are three types of roles in a dungeon (and later on in raids). Tanks, Healers and DPS (or Damage). Hunters are Damage/DPS regardless of what spec they are. Druids and Monks on the other hand can fill all roles as they have the potential to be healers and tanks as well. Tanks: Usually plate wearers (Although Druids and Monks can tank and they wear leather) They have the job of keeping the mobs off the DPS and Healers. When you are in a dungeon, you can tell who the Tank is by the small shield logo by their portrait. Tanks will taunt enemies into attacking them instead of anyone else, if someone else says “I have aggro” it means that they have an enemy attacking them and not the Tank. The Tank will then need to threaten the enemy more than the person it was originally attacking so that it will just focus on the Tank. This can happen if someone attacks the enemies before the Tank has taunted them, or someone has a high DPS or heal that threatens the enemies more than the tank. (Think of when we were killing that huge crab while I was healing you, I was outputting more heals than your DPS so I was generating more threat to them, so they were attacking me instead of you, if that happened in a dungeon, that would be very bad…) If a DPS or Healer is attacked by an enemy and the Tank cannot get aggro back, in most cases the person the enemy is attacking will die if it is not dealt with quickly. Hunters have two problems when making sure that the Tank has aggro. One is that your pet can still have growl on and therefore generate more threat than the Tank if not careful, which is bad news if that happens. The other is that if you fire a shot like Multishot, you might end up shooting enemies that you didn’t mean to and the Tank then ends up with more enemies than they can handle in one go. In a dungeon, where people may be practising a spec or trying out a new one, it’s always advisable to wait a second or two before you shoot at the enemy. This will make sure that the Tank has the enemies attention fully and it won’t go charging towards you. And always, always, always make sure Growl is switched off! Healers: They keep everyone alive. They can also do a small amount of damage dealing but if it came down to healing someone or DPS’ing an enemy, the healing should take priority for them. They are identifiable by the little plus sign by their portraits. All gear material have Healer items as they can range from Cloth wearing Priests up to Plate wearing Paladins. They should not have any aggro from enemies and should be protected from harm by the DPS, if something has gone wrong and the tank can’t rescue the situation quickly enough. Hunters along with other ranged classes are great at going this. Seeing as you don’t have to change targets by running to them, if a Healer is in trouble, you can just turn slightly and target the enemy who is attacking them. Not everyone will do this in dungeons but if the healer dies, you going to be in a worse situation than if a DPS dies. If the Tank dies a healer that knows its stuff can keep the three DPS alive to be able to finish off what enemies are around. No healer means that the Tank will hit the deck if they can’t heal themselves and then, the enemies will switch to you. Healers are more important than Tanks. Protect them! DPS: Stands for ‘Damage Per Second’ and slang for the Damage role in dungeons. Hunters are DPS and therefore are part of the group responsible for killing the enemies. You are there to follow the instructions of the Tank so that the right enemies are killed and to prevent more enemies coming if you don’t need them to. As Ranged DPS you will have an easier time switching between different enemies compared to the Melee classes who have to be standing next to the enemy to be able to inflict damage. Once you go into a dungeon, if it is the first time, there will be quests for you to pick up. Get these as they can grant big XP and gold rewards to you and potentially a nice bit of armor. The group will then start to move forward through the dungeon and kill either everything for the XP or they will kill the bare minimum needed so they can progress through quicker. Regardless of what is done, you need to make sure that you keep up with the group. Any falling behind can result in the group struggling to kill the enemies, you missing out on the XP that the killing gives and at the worst case, you may be kicked from the dungeon due to ‘slacking’ or being ‘AFK’. If you die in a dungeon, most people will res you after the fighting has finished. You can run in but they you may find that the group will move on without waiting for you so you need to be quick. Some dungeons have teleporters to get you through the dungeons quicker and back to the group without wasting time running through it all. If you die at a boss, wait until the loot roll comes up as you may miss it! There are four different types of materials that gear can be made out of. Hunters use Mail gear but there are there are specific Classes that wear each type of gear, this means that there will be times when items drop that you cannot use at all. So while this seems like plate wearers have the pick of everything and cloth wearers get a bad deal, in fact neither of them do. You, as a hunter are able to equip Leather and Cloth as well as Mail but to do so will not be beneficial for you. So even though you can wear a pretty cloth dress, it’s not going to do you any favours. So the cloth wearers only equipping cloth means that thy are equipping items that will be the best for them. Just in the same way that equipping a mail item for a level 50 when you are level 80 will not be good for you, equipping Leather items when you should wear mail is not a good idea either. Once you find a piece of Mail gear, you now have the issue that there are two classes who can use it. The two classes are Hunters and Shamans. While they are both ranged classes, Hunters don’t need something Shamans do. That something is Intellect. If you find that on your gear then it is not designed to benefit a Hunter. The more stats there are on gear the smaller the benefit from them. Intellect will not help a hunter at all so needs to be avoided. Hunter gear needs to have Agility and Stamina on it. The stamina increases your health pool which it’s nice to have a lot of health so you don’t die so easily however in dungeons you have a healer to help that so it’s not so much of a big deal. As your primary role is dealing damage, you need stats that will increase that. Agility makes your shots more powerful, stats that increase your damage are going to be the most important thing to you. There are secondary stats that also increase this but they are flexible depending on what your specialisation as a Hunter is. These secondary stats are not as important at lower levels as they are at max level but if you find something with Critical Strike as well as Agility and Stamina, you’re on to a winner. These will all help a hunter in varying degrees. Hit and Expertise (Exp for short) make sure that your shots don’t miss and also that your shots are not blocked. There is a magical number of 7.5 that you need to get to with those to ensure you are on target 100% of the time. Critical Strike will increase the chance that your attacks will do bonus damage while Mastery will increase the damage from your pet. Haste will make your shots fire quicker. The ranged section on your stats will give you explanations of what each stat does for you if you hover your cursor over it. 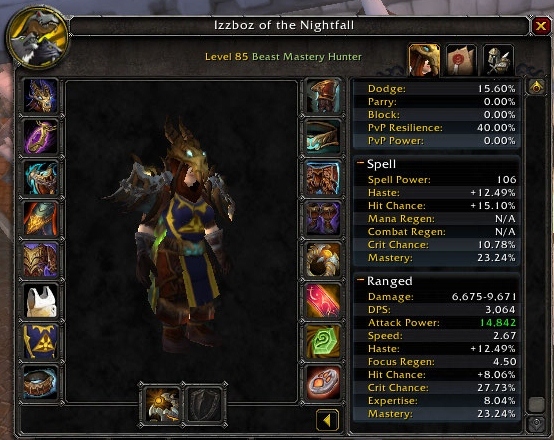 This will enable you to see what stat you want to increase or if you have too much of a stat (eg this Hunter has too much Hit and Exp currently). If you have too much of one stat you can Reforge them. This is where you can change half of one undesirable secondary stat into something else. So you can reforge Hit into Critical Strike if you needed to. There are add-ons which can tell you what to reforge into what but it is worth noting that when Warlords launches, certain stats are going and reforging will not be available anymore. There are some websites that you might find useful to give you tips and advice as you get more familiar with the game. Icy Veins gives lots of advice for shot rotations and also advice on boss encounters in game. Theres lots of tips from members of the WoW community on there. MMO Champion has all the latest news and also a forum full of advice. WoW EU is the official World of Warcraft website for Europe. It has a ‘Getting Started’ section and also a community forum where there are endless topics and also the Customer Service reps at Blizzard pop in on occasion and help out. Petopia is a great place to find all the information on the pets Hunters can have. If you’re looking for a pet that does something in particular then it will tell you what animal you’re looking for and where you can find it. Ask Mr Robot is a great easy to read tool for seeing how you can maximise your gear, you can load any character either you have or someone else has. Great to see what other Hunters are doing with their gear and what their stat priorities are.